-2 men's t-shirts (I can't remember if I used my husband's XL shirts or a pack of mediums that I purchased on clearance). 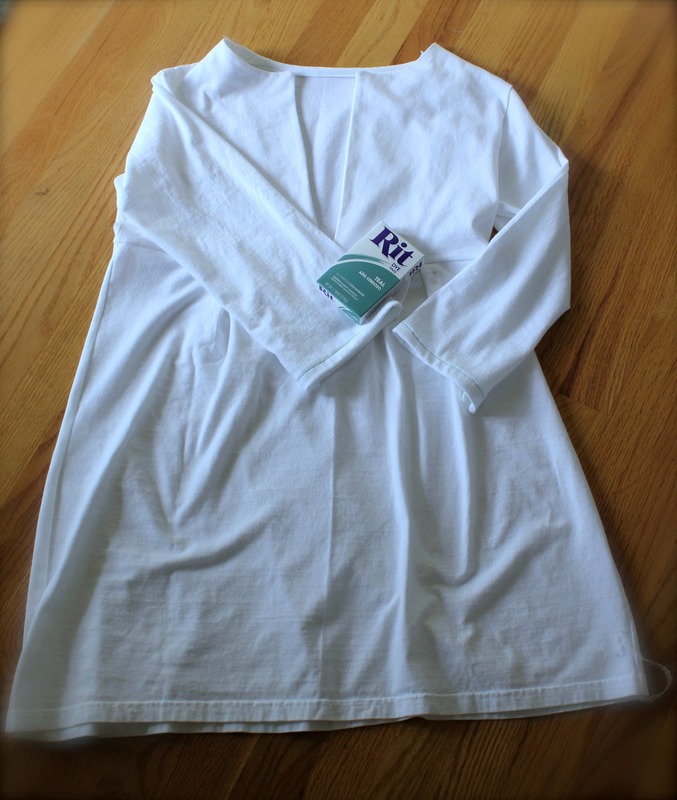 I began by cutting out the schoolhouse tunic pattern using the two t-shirts for fabric. I lined up the bottom edge of the pattern with the bottom edge of the t-shirts so that I would not have to hem the bottom. I tend to find the finishing detail of knit material the most difficult so why bother doing the work that was already done for me? 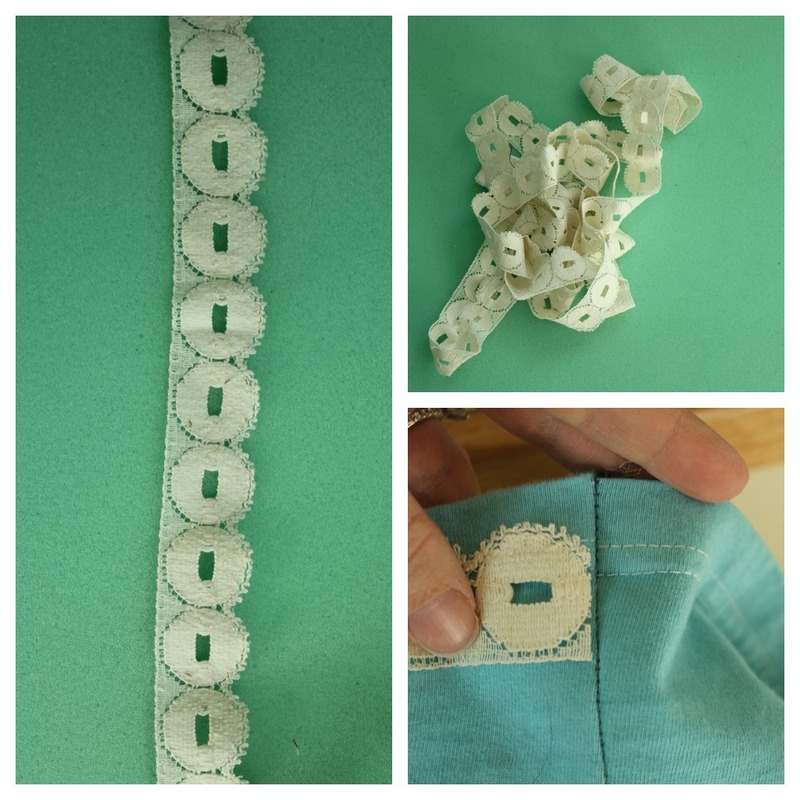 I then stitched the pieces together following the schoolhouse tunic pattern. This is where I made the fitting errors. Since my fabric was knit, it had stretch. I did not alter the size I normally cut for this top and therefore it was too big. After a couple months I finally got around to taking it in an inch on each side. So...make sure you make your top a bit smaller for whatever pattern you chose if you want a close fitting top. And ta da...here it is teal. I could have left it like this and I actually wore it this way once, but it needed something more. So, I dug around my craft room and found this lace trim. 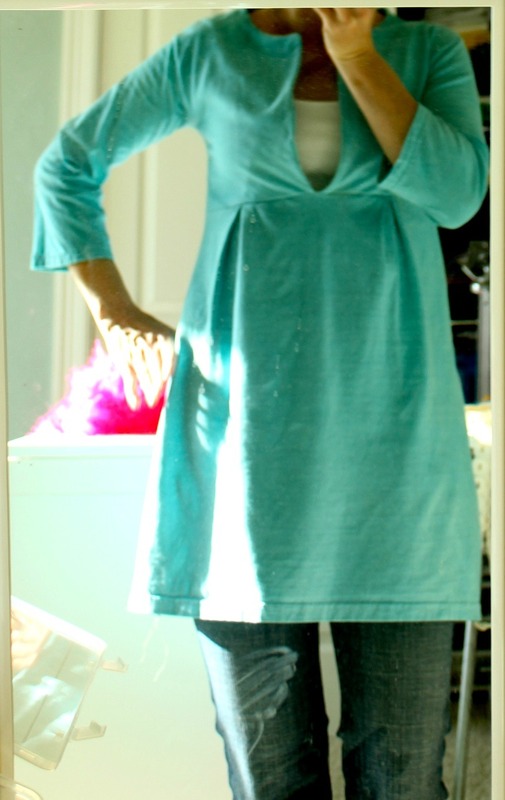 I lined up the trim with the bottom stitching on the tunic and around the bottom sleeve stitching. I then stitched it on using a straight stitch. I think it added a fun detail and makes the top much more complete. Now...off to rummage through the old tshirt pile and see what else I can give new life. and it's so cute in person! Love this! I can't wait to try one for myself. WOW! What a difference. 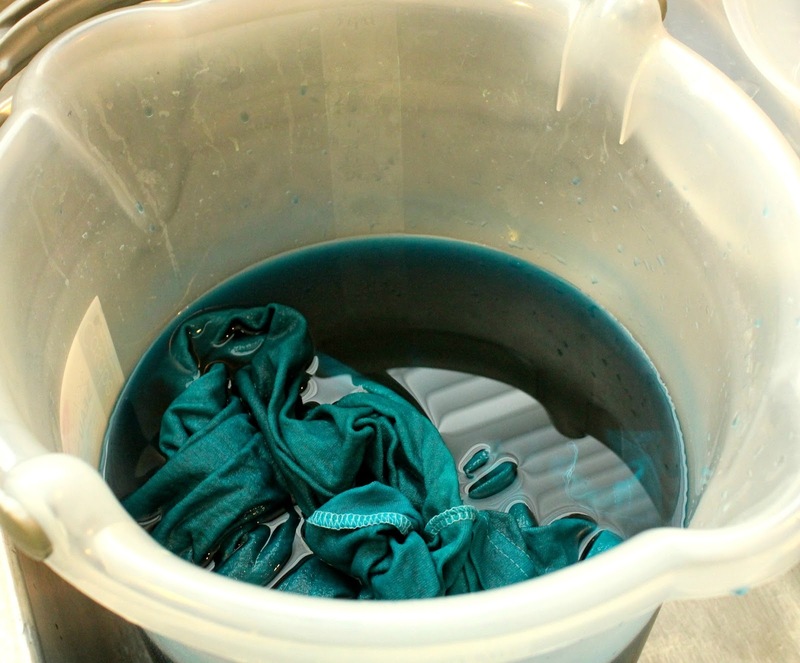 I've always wanted to try dying clothes. I love the color! 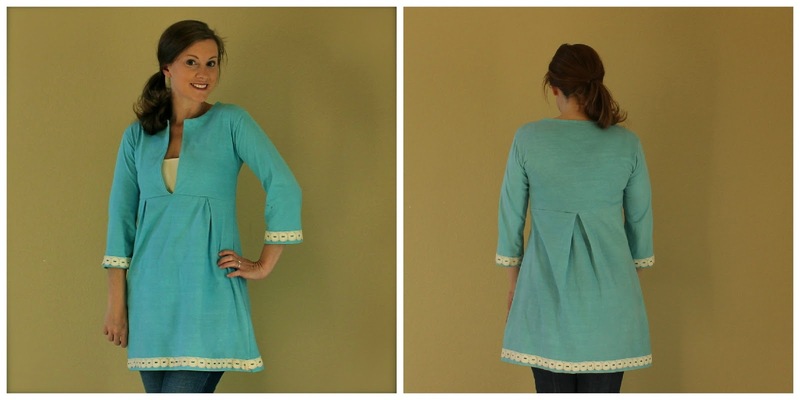 This tunic looks so good on you! Tunics are my favorite style of shirt to wear. I'm pinning this in case I ever get around to sewing for myself! 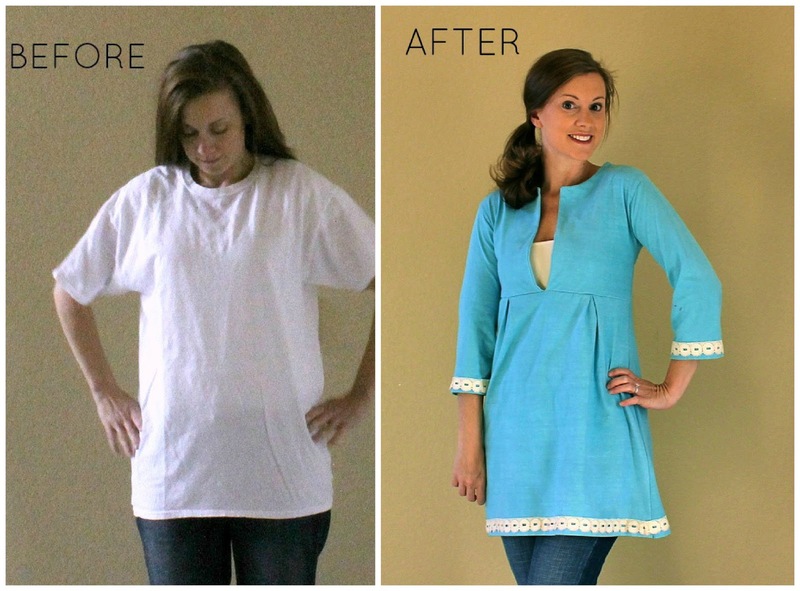 Thank you :) It really is a quick and easy tunic pattern- I would highly recommend it! that's SO cute! one day, i'm going to get brave enough and use my sewing machine to sew something that i can wear... and don't you love what a box of dye can do to just about anything?? Very cute! I wish I liked to sew because this is genius.. What a difference the dye makes. I like the color. love your refashion - very cute! Its just cuteee.Really looking very nice i always try t shirts for men just as a fun.I would love to buy this one.thank you so much for sharing such a nice with us. 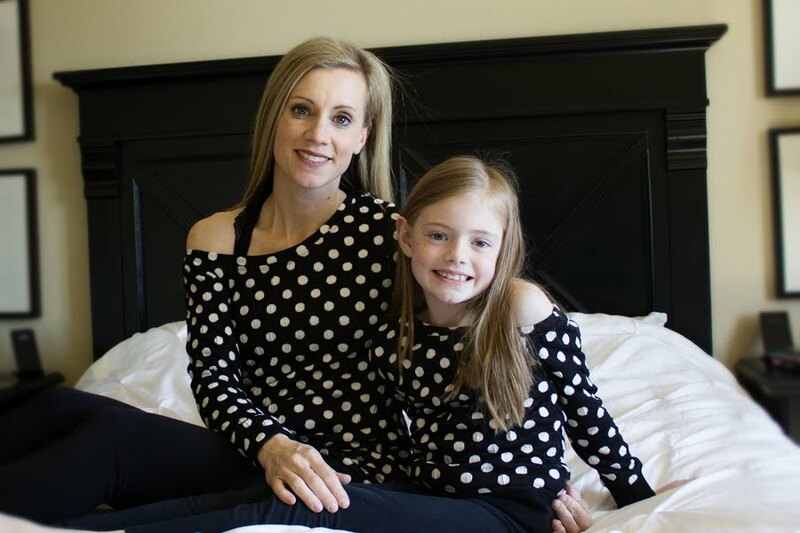 Do you think the stretch in this top would work for nursing? ?